Come cruise with your significant other aboard Montgomery's only riverboat, the Harriott II. Don't miss the boat! 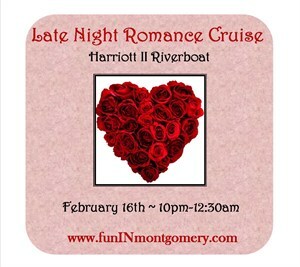 Intimate Valentine's themed late night couples cruise. This cruise is two hours long and includes light appetizers, complimentary glass of champagne and flute, live entertainment & cash bar. Cruise will also feature a diamond drop sponsored by Cronier's Fine Jewelry of Montgomery.